Solar Roadways is a modular system of specially engineered solar panels that can be walked and driven upon. These panels contain LED lights to create lines and signage without paint. They contain heating elements to prevent snow and ice accumulation. The panels have microprocessors, which makes them intelligent. This allows the panels to communicate with each other, a central control station, and vehicles. Many people are surprised to learn that the Solar Roadways panels are made of glass. But not ordinary glass. 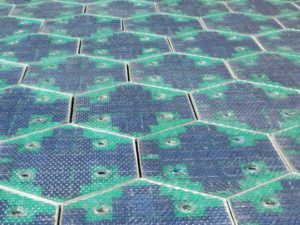 Solar Roadways panels are made of specifically formulated tempered glass, which can support the weight of semi-trucks. The glass has a tractioned surface which is equivalent to asphalt. The new Solar Roadways 3 panel design brings some exciting new changes. Since installing the first prototype parking lot with Solar Roadways 2 panels, Solar Roadways has been working to get the panel design ready for manufacturing, which was one of the goals for the Indiegogo campaign. New equipment has been purchased that will help to take on more of the manufacturing in house. The mounting holes which were used to secure Solar Roadways 2 panels have been eliminated. They have been replaced with edge connectors, which will simplify installation. The mounting holes took up needed real estate on the panels. Removing them provides the panels with room for more solar cells. The solar gain was increased by 25% over Solar Roadways 2 panels. Logos or other designs are now possible in the center of the Solar Roadways 3 panels, for customers who want a custom look. After the Solar Roadways 2 panels were released, there was much excitement from supporters about how the LED colors could be used for driveways and parking lots. Many people contacted Solar Roadways about their desire to use the colors for holiday decorating and entertaining. Solar Roadways decided that the time had come to upgrade the LEDs to allow for a multitude of color options and use brighter LEDs that can easily be seen in the sun this time too. The Solar Roadways 3 panels now offer literally millions of colors in variations to match company color themes and create fun options for families.